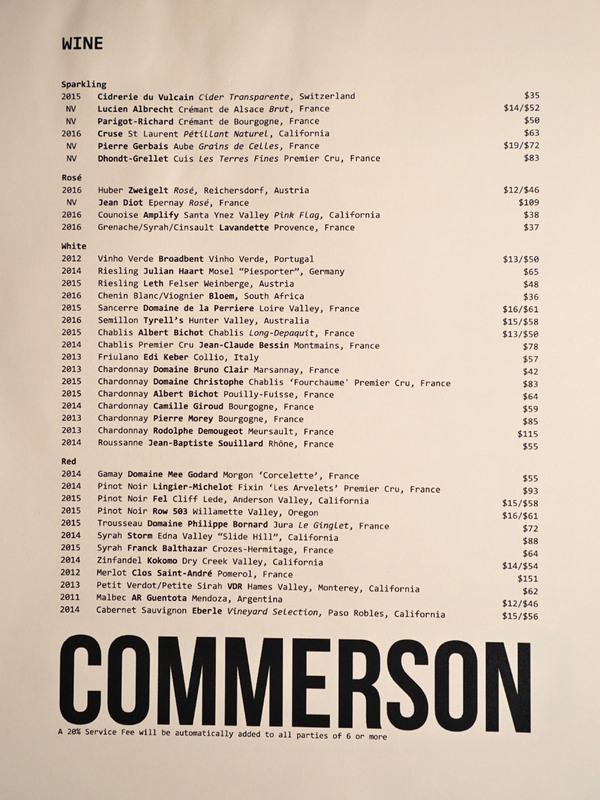 Commerson (named after naturalist Philibert Commerson) was a restaurant that I'd been curious to try for a while now. 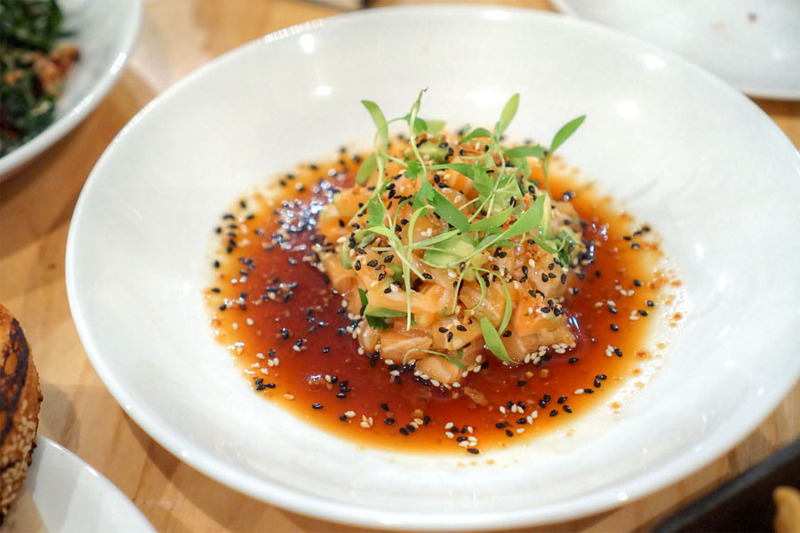 The place was opened in November 2016 by Raymond Eng (Revolution Interactive) and Chef/Partner Sascha Lyon, who'd previously spent five years (2009-2014) at the W Hollywood. Meanwhile, running the FOH is Operating Partner Wes Zelio, whom I last saw over at Taberna Arros y Vi. Lyon left the venture in June though, leaving sous Jose Garcia steering the ship. In October however, a new Executive Chef was announced: Winston Wingfield. About the Chef: Wingfield hails from Gastonia, North Carolina, and initially came to California to attend culinary school at the CSCA in Pasadena. 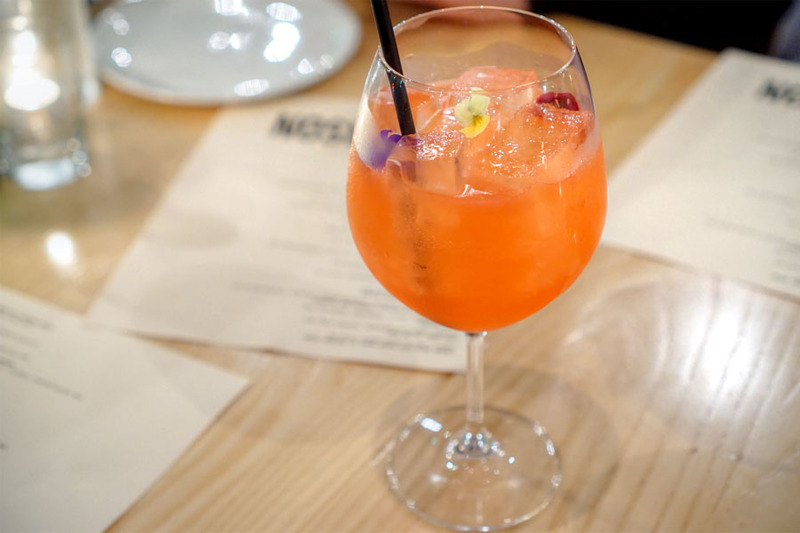 During his time there, he interned at Angelini Osteria, and ended up returning there upon graduation. This was followed by a short stint at Melisse, and in 2008, he helped Jon & Vinny open up Animal. In 2009, Wingfield got on the opening team for Bouchon, where he worked his way up to sous over a period of five years. 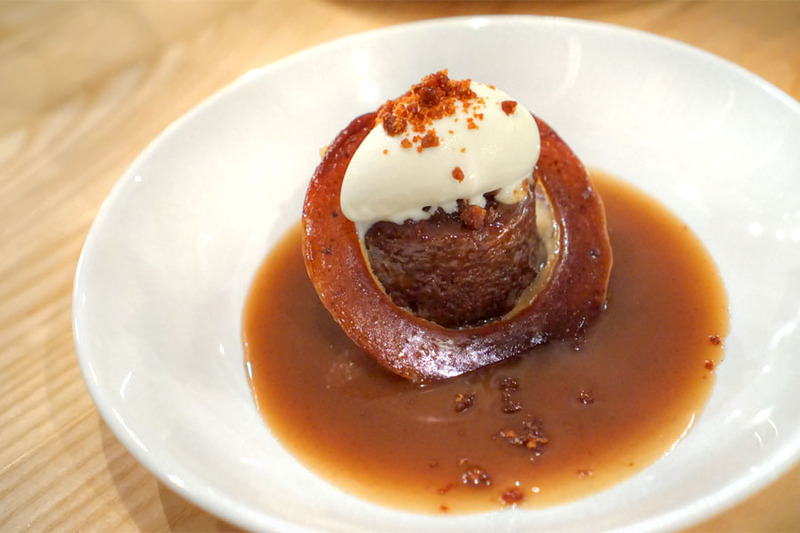 While at Bouchon, he also cooked at Rustic Canyon (under Evan Funke) and Red Medicine. 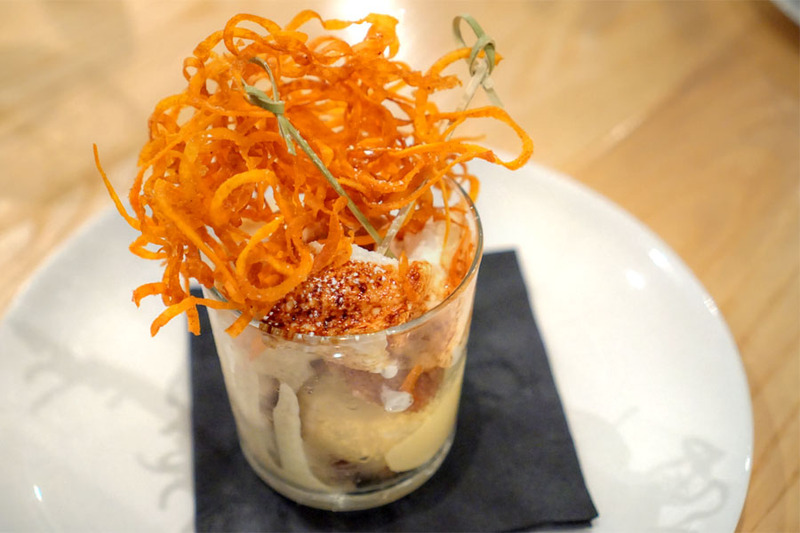 After leaving the Beverly Hills restaurant, he moved to the short-lived Fifty Seven with David Nayfeld, then helped with the development of Barrel & Ashes, which debuted in November 2014. The following year, B&A's Rory Herrmann convinced Wingfield to take the CdC role at Jason Neroni's Catch & Release. 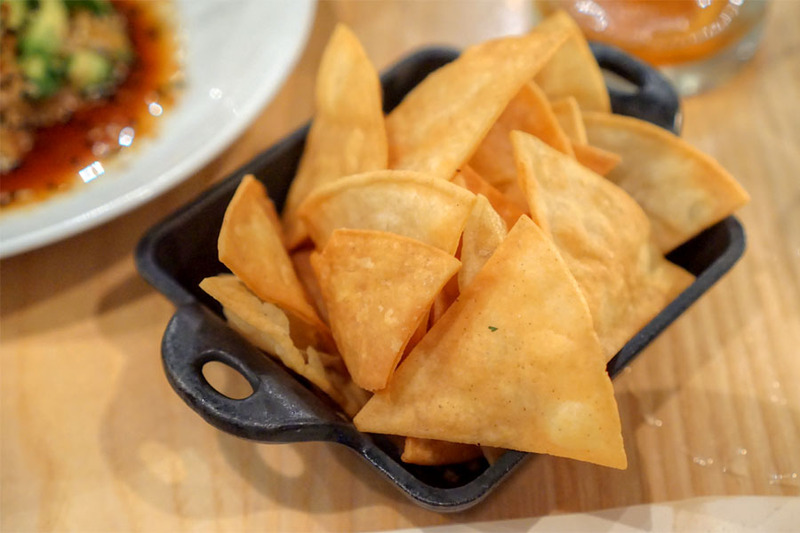 Set in Ricardo Zarate's former Paiche space, that restaurant opened in May 2015, but closed just eight months later. The Chef was last seen helping out with private cheffing gigs and assisting his fellow chef friends. 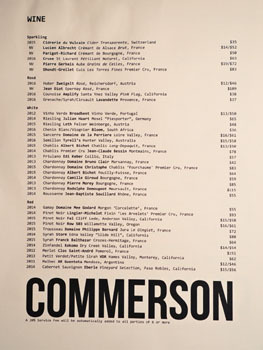 Commerson sits on the ground floor of the Wilshire La Brea apartments, just down the street from Republique. The space was penned by Rita Lyon (wife of Sascha), and features an uncomplicated aesthetic with a hint of modernism. 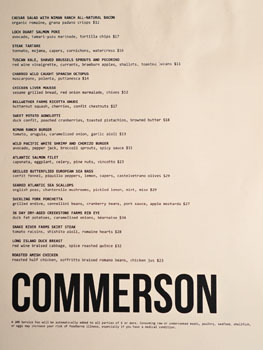 Commerson's menu has a sort of internationally-influenced, Cal-modern bistro feel to it that fits the neighborhood-y feel of the place. To drink, the wine list leans heavily on France and California, and you also get a few beers as well as cocktails created by Dushan Zaric (co-founder of Employees Only and Macao Trading Co) and Dee Ann Quinones (Westbound, Booker and Dax, 69 Colebrooke Row, The Parlour Room, Philippe Chow, Street), among others. Click for larger versions. 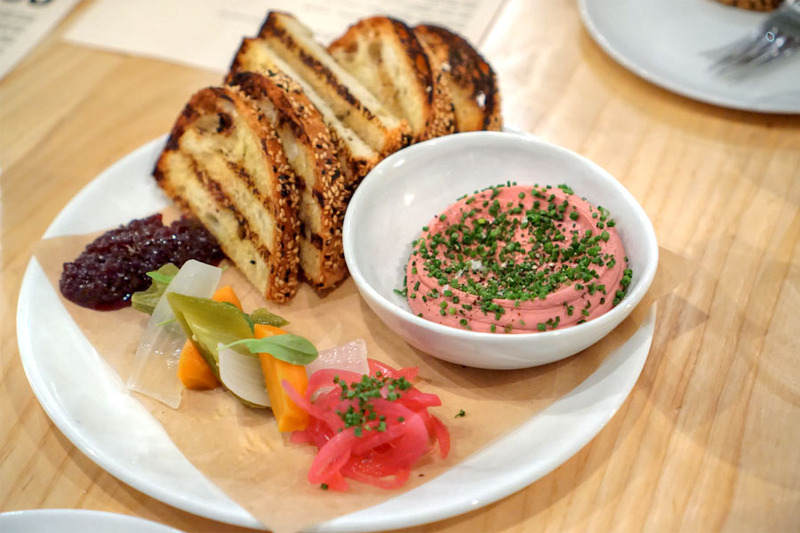 We began with a lovely rendition of chicken liver: a smooth, creamy mousse with an elegant earthiness and well-placed stings of salt. It worked beautifully with those crunchy pickles and sugary marmalade. 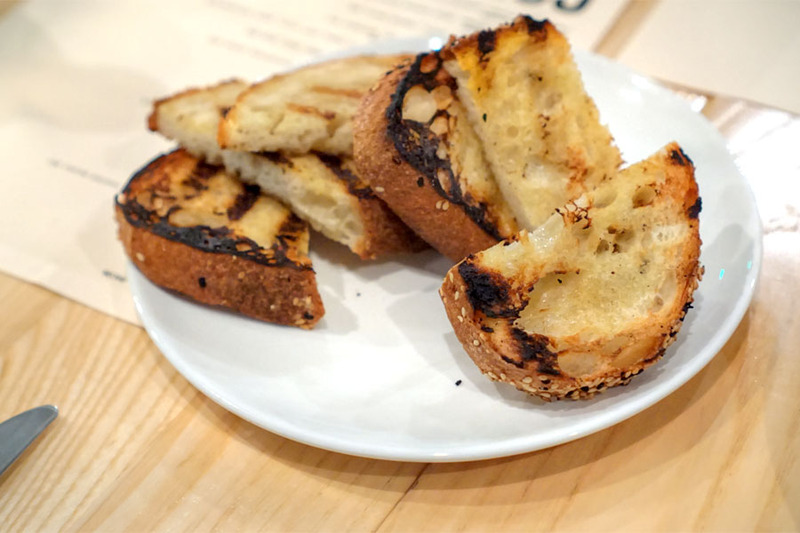 Excellent char and crustiness on the included bread, too. A strong start. Our first cocktail went down easy: a light, refreshing drink with just enough astringency to keep things interesting and a finish filled with zesty ginger. The poke craze continues. I'm tired of it, but this dish definitely worked itself out tonight. The salmon ate lush and fatty, and married well with the simultaneously savory and tart notes from the tamari-yuzu. Avocado added a creaminess to the course, and I appreciated the herbs up top as well. Excellent chips, also. 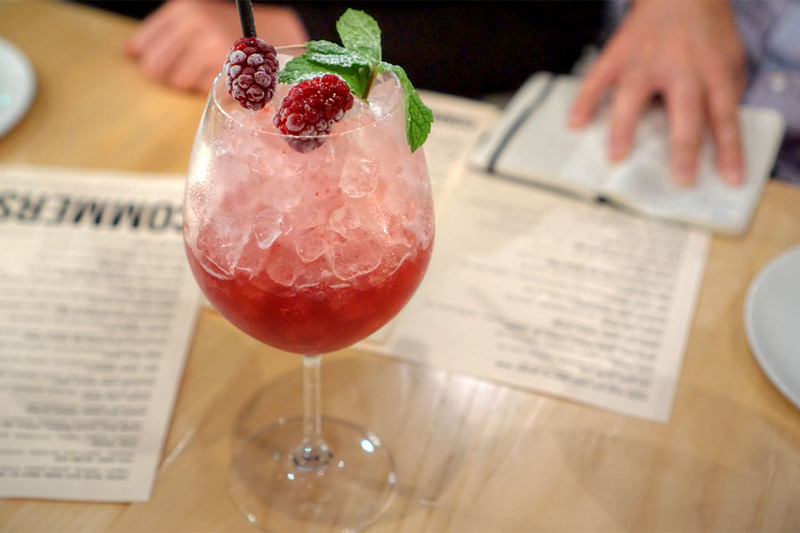 This straightforward rendition of the classic cocktail delivered a boozy nose brimming with dark fruit and botanicals. The palate was thick, hot, with a sugary base and more bittersweet, herbal notes. 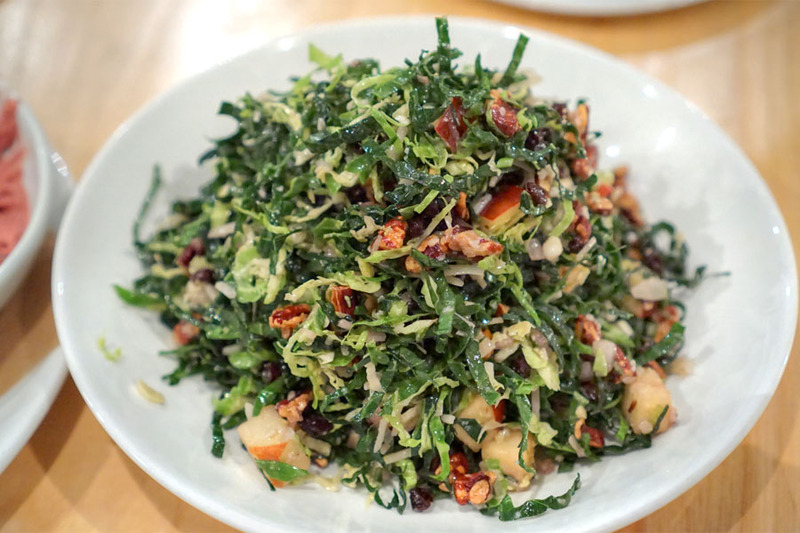 The requisite kale salad was nice enough, giving up a myriad of nutty, sweet, bitter flavors and crunchy textures, with a dosing of salt from the Pecorino. I didn't really get much from the Brussels, though. 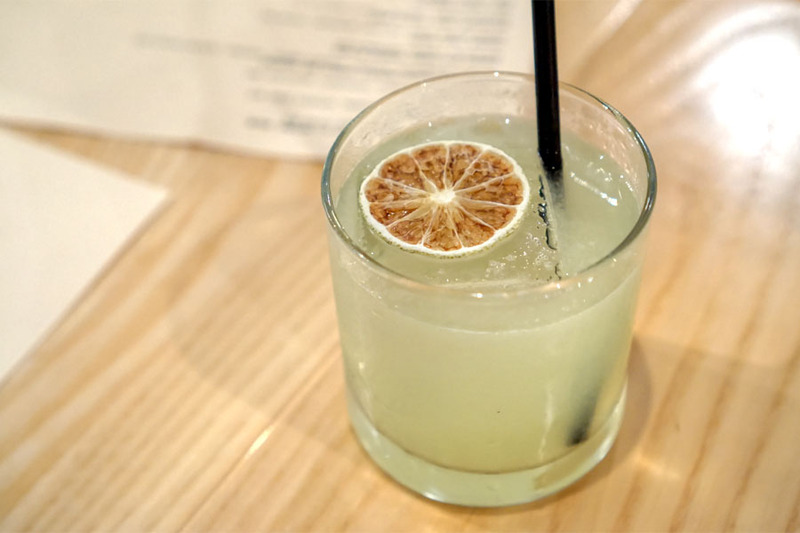 A combination of tequila and mezcal made for a pretty intense cocktail. The nose here was decidedly woody, vegetal, with a hint of citrus. The taste followed, delivering more of the same along with some earthiness and an unexpected touch of brine. 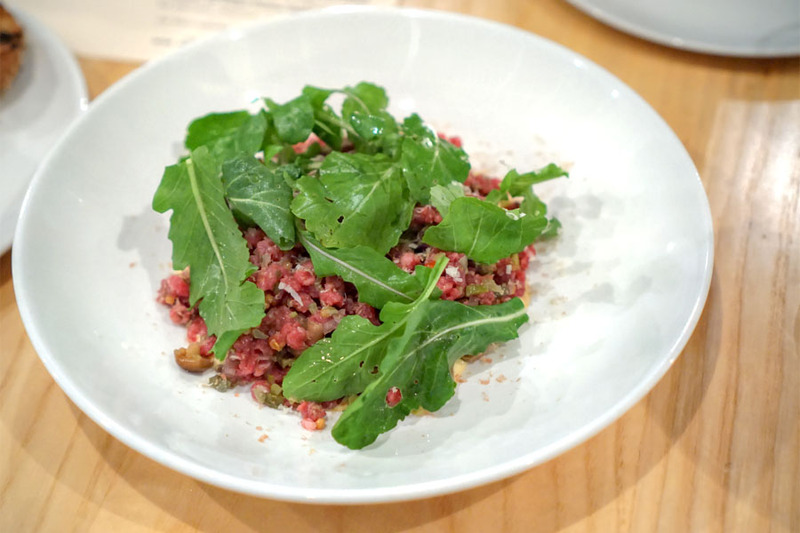 The tartar made a strong case for itself, and was one of my favorites this evening. The beef had a great texture to it, and its traditional accoutrement of capers was joined by the salty, briny essence of tuna in two forms: tonnato sauce and mojama. The bread, meanwhile, was just as good as it was with the mousse above. Wonderfully smoky, nutty, and crusty, it came from the new-ish Boulangerie de Paris in Boyle Heights. The cobbler was probably the most gluggable of our cocktails. We got flavors reminiscent of both jamaica and Welch's, with lots of grape-y Porto character and astringent, oxidative undertones for contrast. Our next dish was apropos for the season. 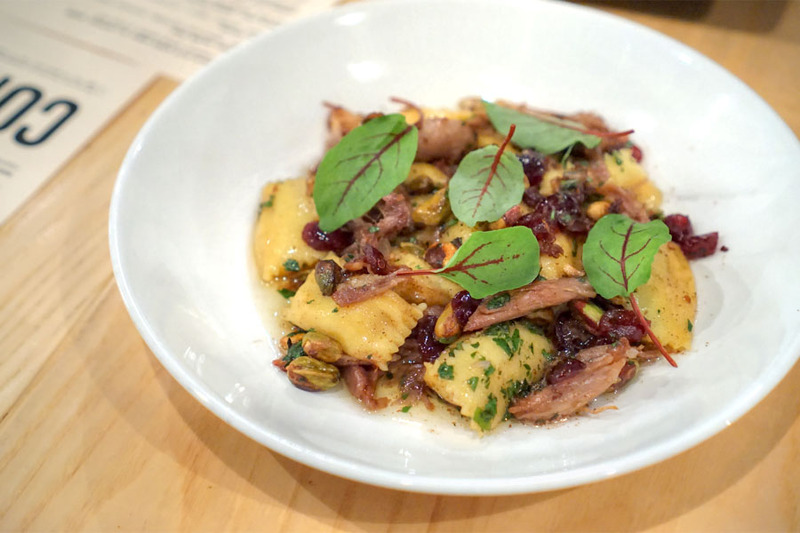 The agnolotti were sweet, but fortunately not overwhelmingly so, while mushrooms and a rich confit made for some semblance of balance. At the same time, the addition of pistachios resulted in some nice textural variation. 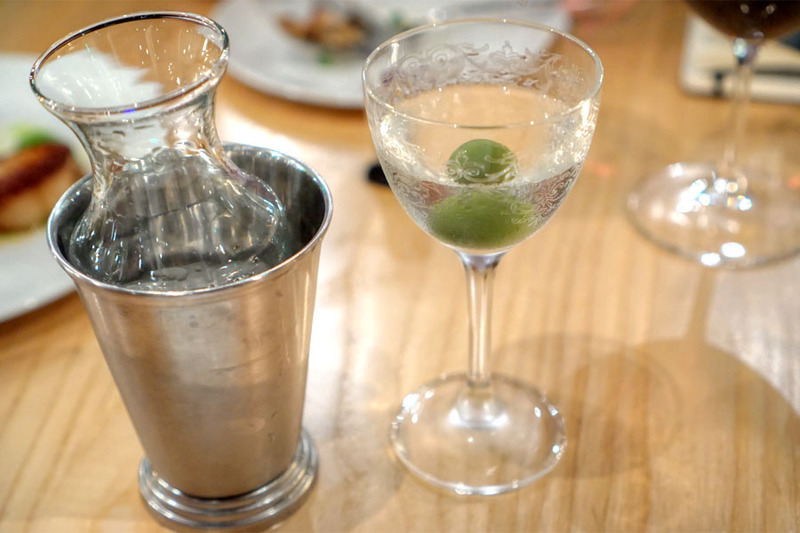 A traditional take on the dry martini was pretty much just what you'd expect, with the boozy, botanical nature of the gin on proud display. 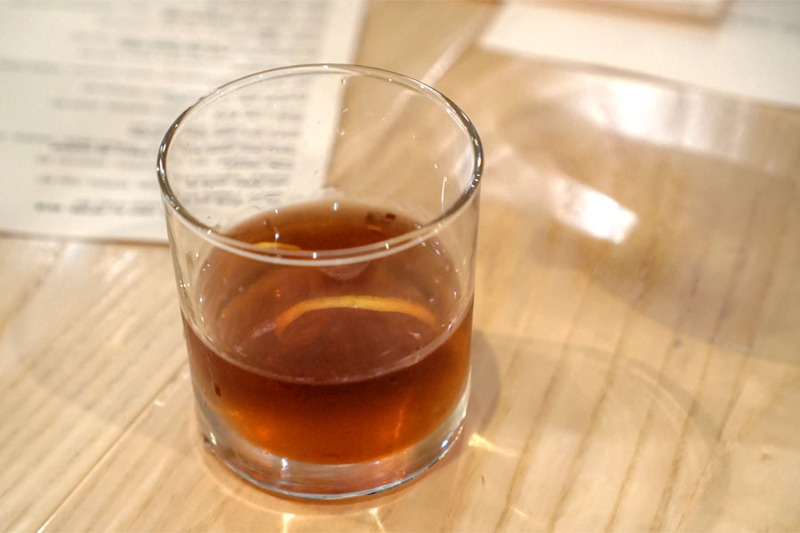 Note that the glass here appears to be the exact same one used for the "Ella Fitzgerald" over at Birds & Bees. The octo was a must-try for me, and another favorite. 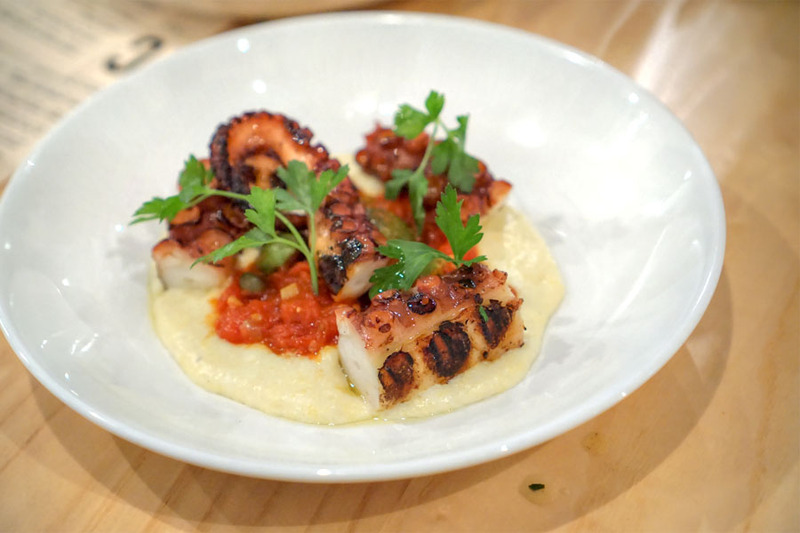 Think meaty and just slightly chewy, with lots of smoky, saline flavors paired with the piquancy of puttanesca, all while the polenta lent a moderating hand. 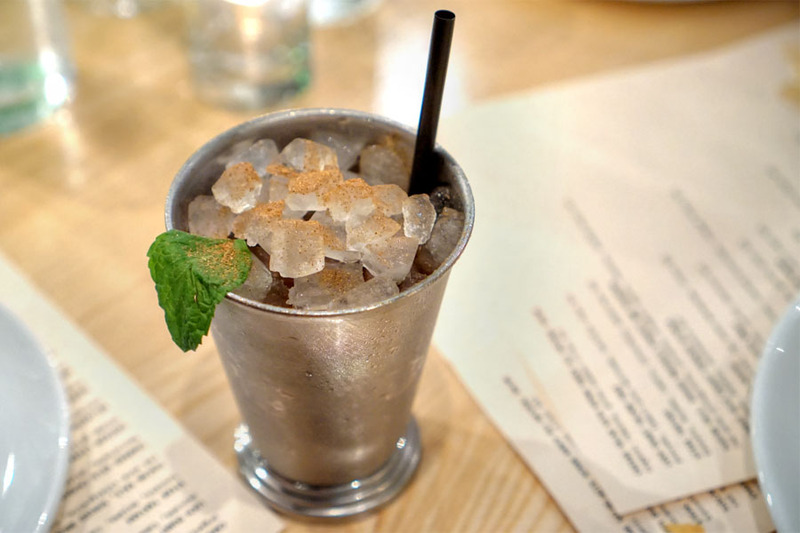 A reworked julep definitely showed off the bittersweet, vegetal nature of Cynar, evened out by the application of grapefruit and just a smidge of spice from the ras el hanout. 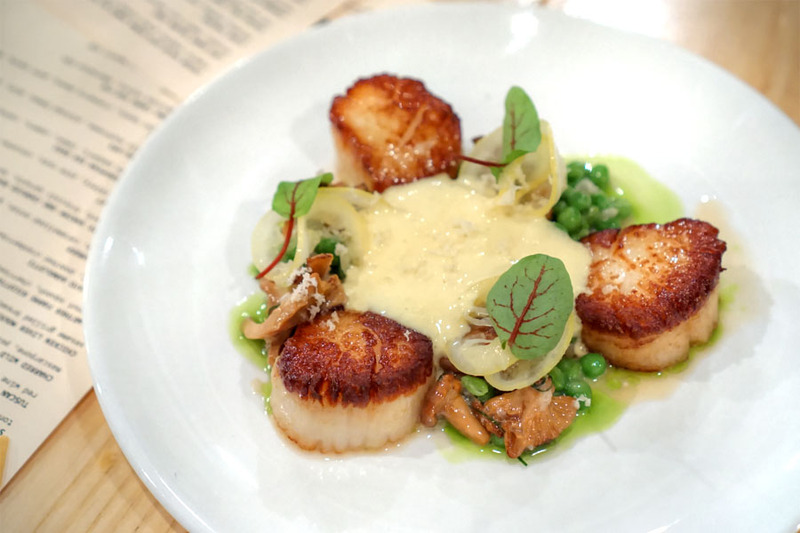 Scallops had a nice cook and caramelization going on, their ocean-y flavors well-matched to the brightness of peas and the woodsy shrooms while the lemon added a very noticeable sourness to the dish. 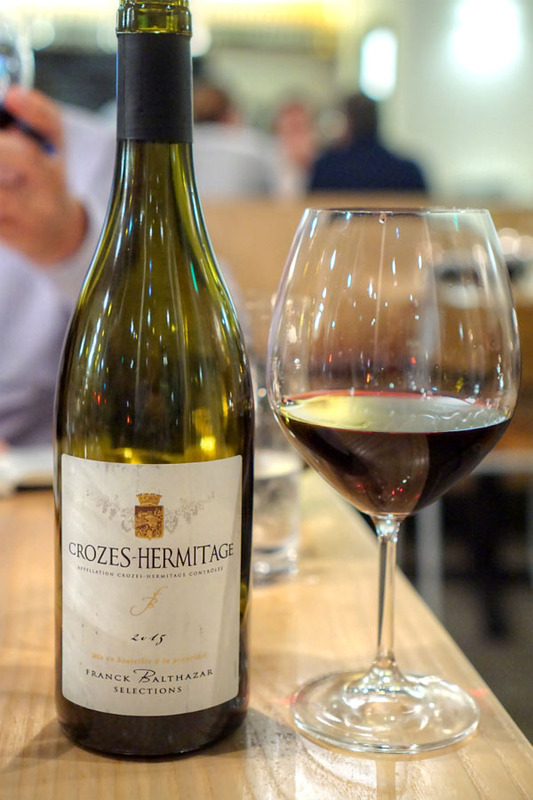 We moved on to wine at this point, specifically a bottle of the 2015 Syrah Franck Balthazar Crozes-Hermitage, France [$64]. It displayed appealing aromas of dark fruit and strawberry. Taste-wise, things went in a peppery, spicy direction, but with a soft fruitiness to it and a whisper of herb. It was now time for our meatier mains. 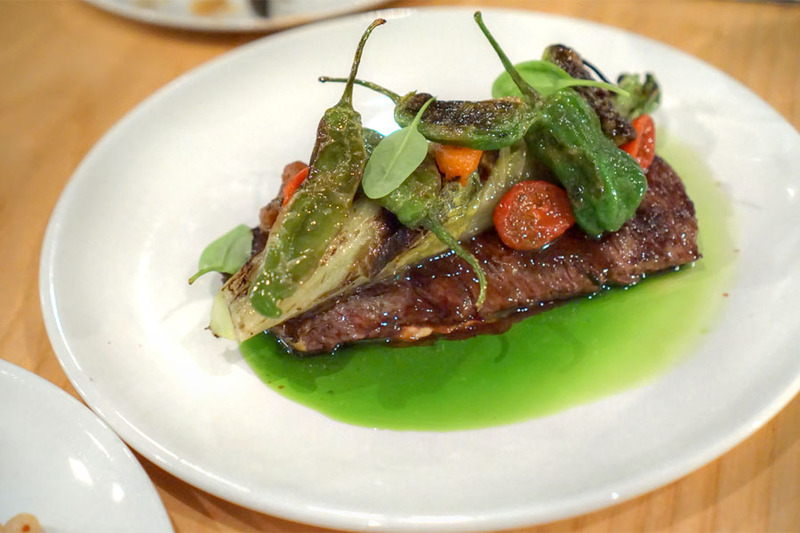 Commerson's take on porchetta arrived juicy, tender, with aggressive seasoning and a good balance between fat, lean, and all the crispy bits. 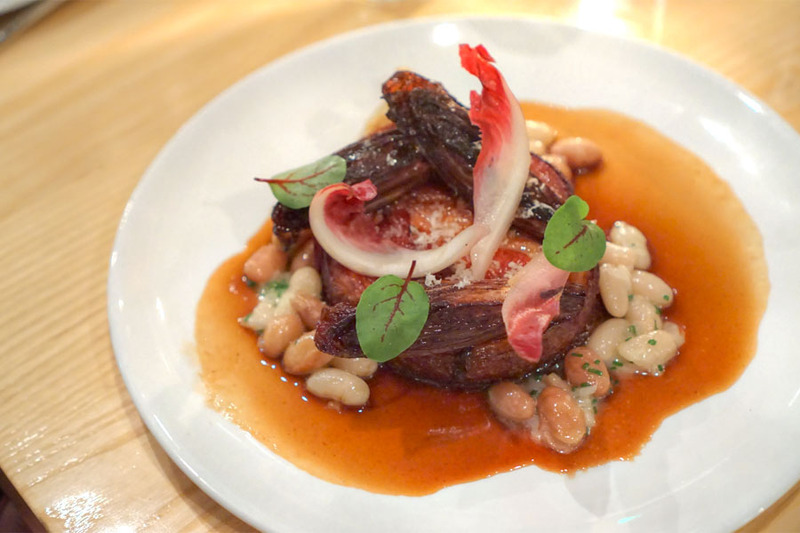 The bitterness of the endive functioned as counterpoint to the pork, as did the beans. 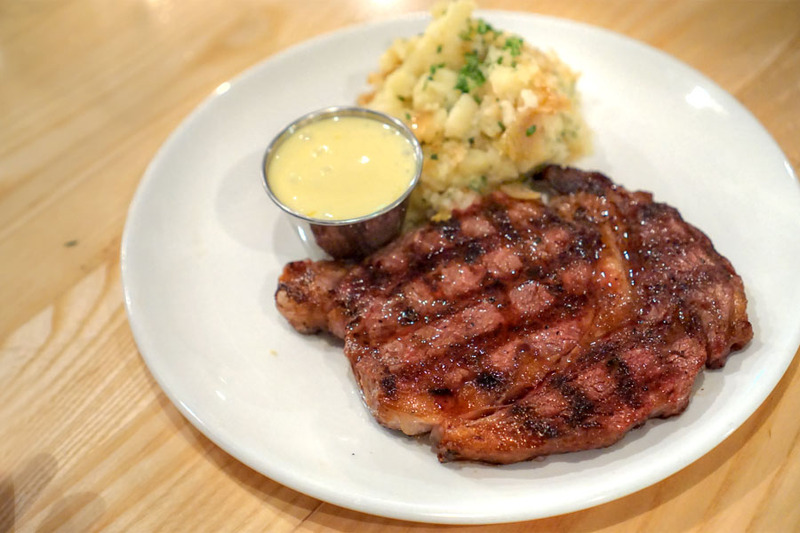 The ribeye was on the thin side, and thus its temperature was a bit over what we'd requested unfortunately. Its taste was as expected though, and I was certainly a fan of the potatoes. The skirt steak was more interesting. It had a slight chew to it, and I quite appreciated the crunch and lightness of the lettuce, while shishitos added a touch of heat. I also detected what I believe was horseradish and mint in the dish, both of which worked. 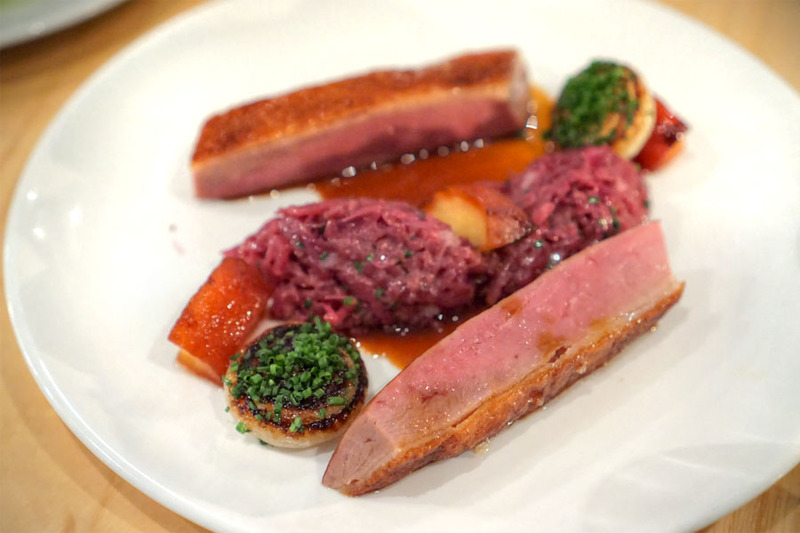 A delightfully crisp-skinned duck breast came out super flavorful, and had a sort of honeyed, sugary edge to it. The cabbage was a nice pairing, and I quite liked the quince as well. Probably my favorite of the mains. 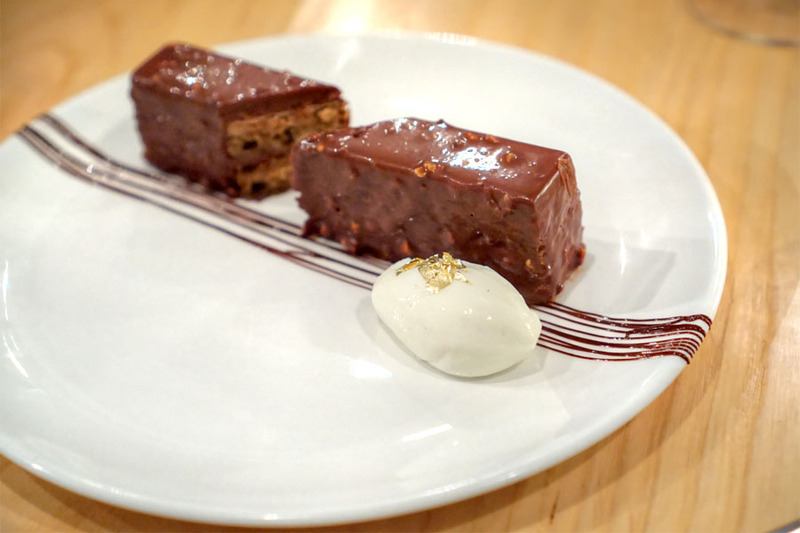 Complimentary desserts were the work of Pastry Chef Elizabeth "Liz" Sencion, who's been at Commerson since the start. Previously, she worked at Montage Laguna Beach (under Lee Smith), Delphine at the W Hollywood (where set met Lyon), The Peninsula Beverly Hills, Beverly Wilshire Hotel, and Viceroy L'Ermitage Beverly Hills (that's a lotta hotels!). Click for a larger version. Sencion's opera cake displayed a welcomed marriage of chocolate and hazelnut, along with soft, coffee-soaked sponges and just enough whipped cream for balance. Some nice textures here, too. 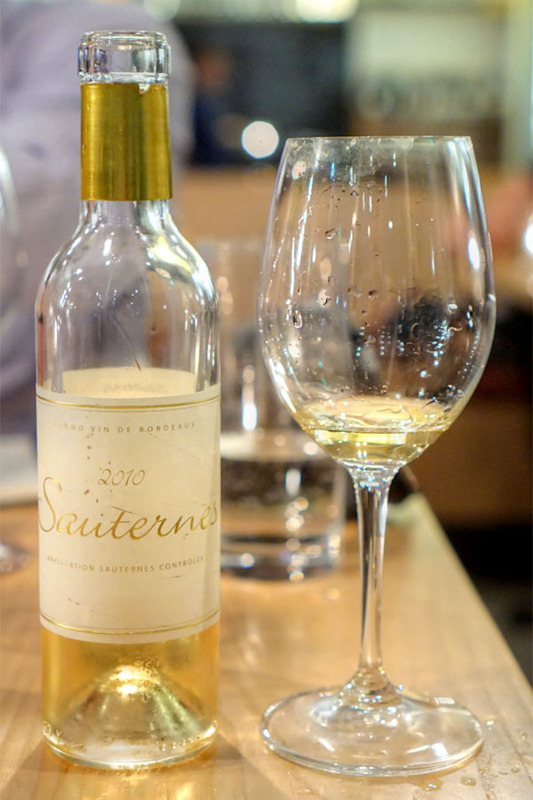 One of my dining companions brought along a bottle to share with everyone, including the staff: a 2010 Sauternes, which is apparently unlabeled, declassified Château d'Yquem. Aromas were rife with honey, pineapple, and stone fruit. On the palate, think decidedly viscous, with honey, dried apricot, golden raisin, and moderate acidity all leading to a long lasting finish. Yum. Now this was a rather autumnal dessert. It had an almost South Asian-y spice to it, one that made sense with the maple-y ice cream and sugary marshmallow. Yams, meanwhile, added a contrast in texture. We ended with the sticky toffee pudding. This was exactly what you'd want, with its hefty flavors of dark fruit and caramel tempered ever so slightly by the mascarpone. 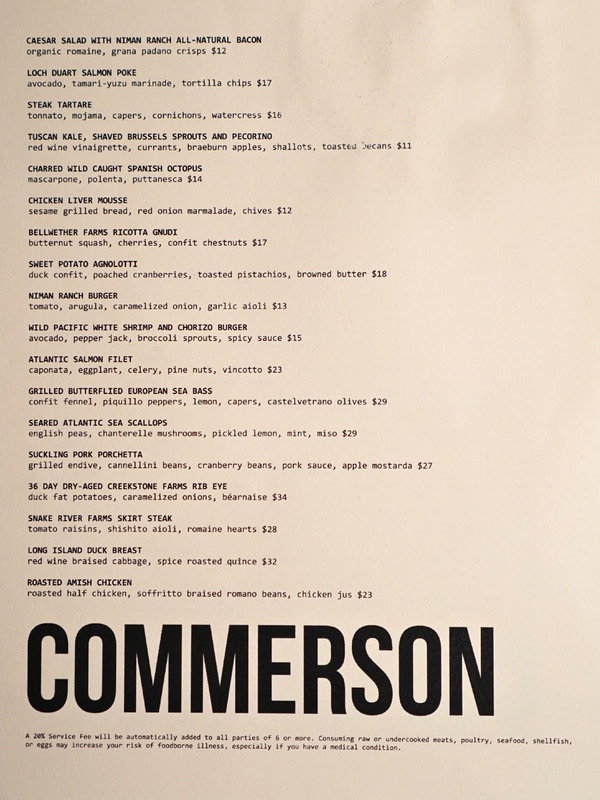 Despite the recent change-up in the kitchen, things seemed to be running quite well at Commerson, with smooth service and no huge hiccups in the food. The cooking's interesting enough without being unfamiliar, which is important given that this is supposed to be a neighborhood type spot. And from what I gather, Wingfield is still working on redoing the menu, so I'd expect more changes in the future. The ice cream on the cappe is mushroom flavor. That was the bombdiggity dessert in that place. I really did enjoyed this as well. colorful party. interesting. It will be delicious.